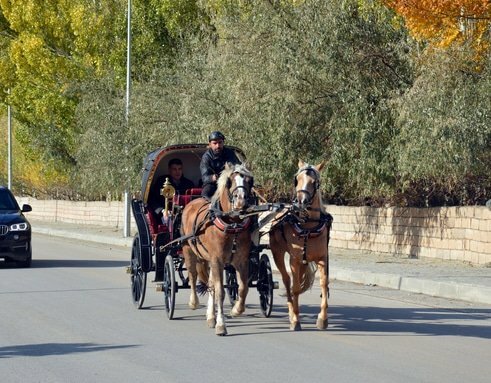 AĞRI (AA) – A “nostalgic city tour” is offered to the visitors with a phaeton served by the municipality in the province of Dogubayazit of Agri. Ağrı Mountain, Ishak Pasha Palace, Bayazit Mosque, Urartu Castle, Ahmed-i Hani Türbesi, Ahmed-i Hani City Museum and Eski Doğubayazıt House in the district, which attracts domestic and foreign tourists. Provided to the district tourism by the Dogubayazit Municipality, which was commissioned by the Ministry of Interior, a “nostalgic city tour” is offered on the 3,000-year history of the region with visitors. Dogay Kayıt Vice Mayor, Kaymakam Ulaş Akhan, told AA correspondent that they had signed the works in accordance with the historical texture of Dogubayazit. “Having a very rich wealth of values ​​that reflects the cultures and history of nature, our inhabitants have a peaceful and trustful environment in the region, and these values ​​have become more prominent and recognizable, and as the days have become more and more interesting for domestic and foreign tourists, we want to sign a nostalgic work that is appropriate for the people of our town and for our guests. “Our guests will bring a nostalgic feel to the touristic trips with the phaeton we have won. Elif Yakis, who made a city tour with a phaeton, said, “We have a lot of examples in the West but we have come to such a thing for the first time in the region and I was very happy to have a nostalgic trip. used expressions.